When James Woodford was confronted by half a dozen sharks swimming at full speed, he froze in shock. But he was even more surprised when they swan right past, completely ignoring him. He couldn't reconcile this experience with the mindless eating-machines that dominate the discussion of sharks in Australia. Interviewing world-renowned experts and joining research teams at Neptune Islands, one of the most famous shark aggregation locations in the world - and consequently one of the most dangerous dive sites - James investigates these intriguing creatures at close range and discovers their fascinating world. 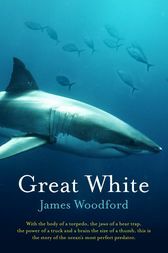 James Woodford is the author of six books including The Wollemi Pine, The Secret Life of Wombats, The Dog Fence and The Great Barrier Reef. He was born in 1968, has four children and lives on the reef in Townsville.